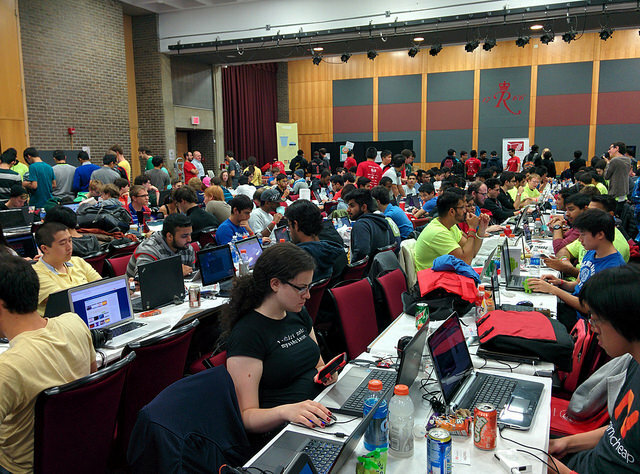 My all-time favorite hackathon took place this past weekend at Rutgers University in New Brunswick, NJ. Now, I'm definitely biased this being my alma mater and all (plus having helped plan and run it for a year and a half :P) so please keep that in mind with what follows. Here are a few things that I think HackRU continues to do well. At no point has HackRU "tried to get bigger." Bigger does not always mean better when it comes to hackathons. As attendance grows, it becomes much harder to provide an exceptional experience. 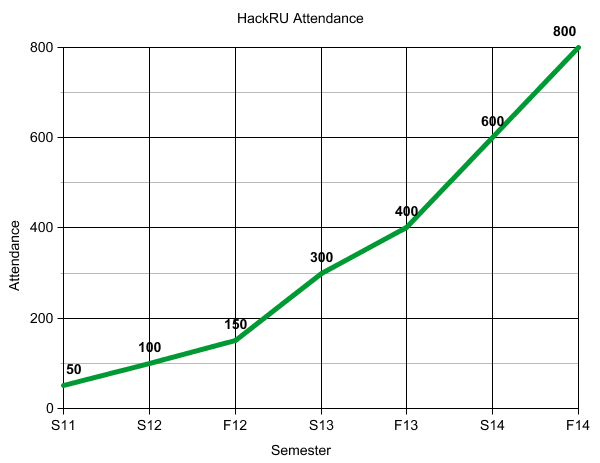 The very first HackRU took place in the Spring of 2011 and had a whopping 50 hackers in attendance. 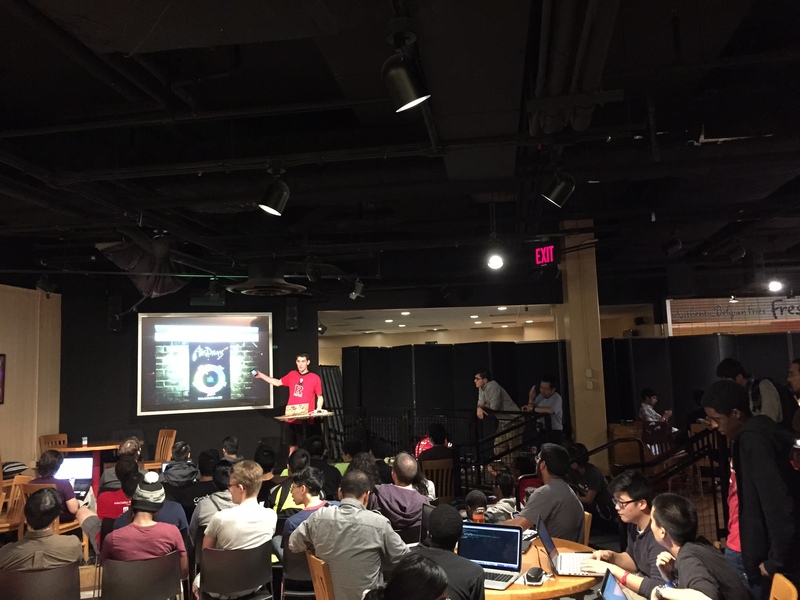 This past HackRU had 800 attendees and it was the best one yet! I think a large part of this is that the organizers have organically improved at running the event semester to semester and the headcount has pretty much grown linearly. It's much easier to increase by smaller steps each year than immediately jump an order of magnitude in scale. There is nothing better than a large, open hacking space where everyone is together. There is just so much energy in a room like this that just isn't present when everyone is distributed. Now it's not always possible to have an open venue, but the more people you can have in one area, the better. Each HackRU has had a large room filled to the brim with hackers as well as several smaller rooms for overflow and a different scene. Prizes at HackRU are handled with care. I've personally always felt that prizes should be minimal for events like these, especially when student run. The style has always been to have multiple smaller prizes across a wide array of categories to distribute the love as much as possible. The focus will also never be on prizes. It won't be presented as a driving factor to the event. The top prizes this year were thankfully provided by the kind folks over at MLH, but in past years ranged from $256 to $1024. I think this is one of the best things that HackRU has done. The organizers are always willing to negotiate and work with sponsors. They are very worldly about what it takes for a company to sponsor an event, especially with the increasing amount of student-run hackathons. They have never gated the ability to give away a company specific prize or deliver a tech talk about something awesome. Bigger yet, they have never gated mentors. 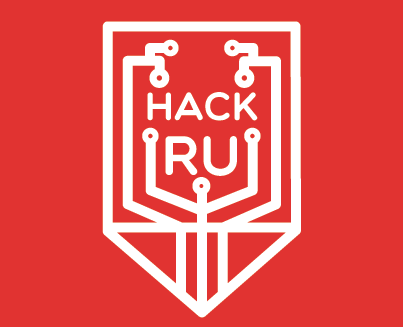 HackRU welcomes every single mentor that wants to come. Even if a company cannot be a sponsor this time, they encourage and welcome any mentors they can send. If you ever have the opportunity to attend a HackRU, don't even think about it, just go. You will have a great time. It was truly an honor to be on the other side of the event this time. Thanks HackRU team for another kickass event!